The editor would like to thank Director of NIIKhimmash A. A. Makarov and leading engineer V. L. Galyaev for their tremendous help in preparing this section. 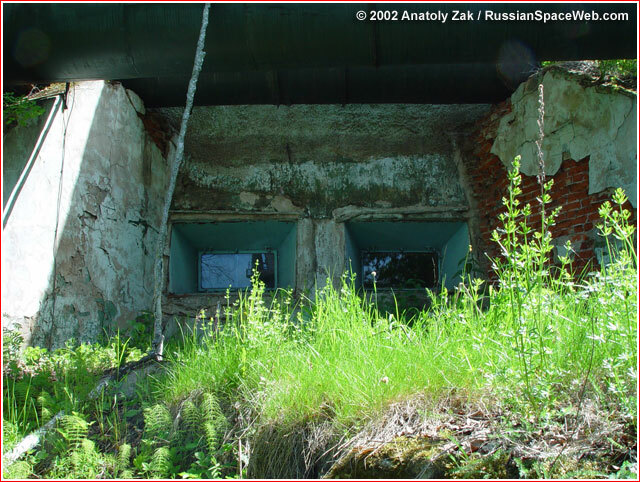 Few Muscovites could guess during the Soviet period, that in thick woods not far from their metropolis was hiding Russia's top-secret space facility, test firing full-scale rockets. Yet, residents of villages around town of Zagorsk (former Sergiev Posad) would sometimes hear threatening roar somewhere behind a sea of pines and birch trees. While it sounded like a rocket, no flying object would ever appear over the horizon. 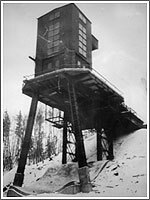 The beginning of the Soviet ballistic missile development program in 1946 demanded the creation of a test center, which could be used for firing of large rocket engines in stationary position, before they could be tried on the actual flying rocket. 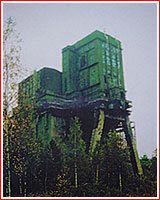 Soviet engineers who studied rocket technology in Germany in 1945-1946 saw just such a facility in Lehesten, Thuringia. With the decision to transfer the Soviet rocket development from Germany to the USSR, a new hidden location was needed inside the country. 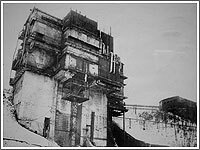 A government decree dated June 11, 1948, officially ordered Ministry of Armaments to build such a "test station." Administratively, it was declared as Branch No. 2 of NII-8, the country's key organization in the development of long-range rockets. The design of the site was conducted by the GSPI-7 institute, later known as OAO Ipromashprom, and still responsible for Russian space infrastructure. Developers started with a search of a possible site on the ground and from the air, looking for unpopulated wooded areas with deep ravines and steep slopes, which could provide a natural flame trench for rocket exhaust. Such site was found 17 kilometers north of the ancient town of Zagorsk (formerly Sergiev Posad). It was some three kilometers from Yaroslavl Turnpike and three kilometers south of Krasnozavodsk settlement. This spot was used as a timber production site during World War II. A nearby Kunya River was forming a huge 30-meter-deep ravine in the area. 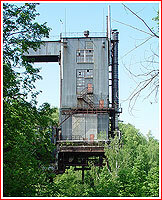 The actual construction started in July 1948, and included Test Stand No. 1, an oxygen plant, a power station and auxiliary facilities. A 1,000-meter processing building was also erected. Finally, an access road across swampy woods had to be build as well. As often, the work had to be done in a hard-to-reach area with little infrastructure for people. Initially, all equipment had to be brought to the site by crawling tracks. An initial residential area, consisting of wooden cottages, was called "Novostroika" (new construction site) and became a nickname of the entire center for several following decades. It was apparently even used as a quasi-official code-name for the center in classified documentation. Although the site near Zagorsk had been considered top secret, some of the original hardware for the first stand was shipped here from Germany and German engineers, who were involved in the program knew about the existence of the center. The first test firing at the site was scheduled for December 1949, for which the NII-88 institute was assembling a Soviet copy of the V-2 (A-4) missile, known as R-1. By that time, key facilities at the site were completed and on Nov. 11, 1949, NII-88 formally declared its Branch No. 2 operational. For the first test, key rocket industry officials, including Minister of Armaments Dmitry Ustinov and his deputy S. I. Vetoshkin, Korolev himself and his future successor Vasily Mishin, as well as the chief of NII-88 Lev Gonor came to Novostroika. Leonid Voskresensky, a leading test engineer at Korolev's design collective oversaw the firing. On Dec. 18, 1949, at 20:52 Moscow Time, in a bitter cold, the R-1 rocket No. 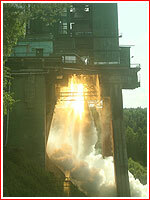 24, with RD-100 engine fired for the first time at Novostroika. The engine burned successfully for 53.75 seconds and, after a post-firing inspection was declared suitable for further tests. It was confirmed on Dec. 31, 1949, when the second test took place. However, at the engine shutdown the rocket was engulfed in flames and fire-safety system showered the test stand with water, which immediately frozen, turning the facility into a giant iceberg. According to witnesses, the stand remained in its icy sarcophagus until April 1950. Along with test flights in Kapustin Yar, firings at Novostroika paved the way to the experimental deployment of the first Soviet long-range ballistic missile. 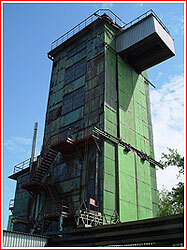 In April 1954, the construction started at Novostroika's biggest engine-firing facility - Test Stand No. 2. The facility was completed in July 1956. A month later, on Aug. 13, 1956, Branch 2 of NII-8 was reorganized into an independent organization designated Scientific Research Institute No. 229, or NII-229. On the same month, boosters of USSR's first intercontinental ballistic missile, R-7, fired at Test Stand-2 for the first time. First test stands were followed by an array of other installations for testing rocket engines and imitating conditions of space flight. Six decades later after the foundation of the first rocket stand near Zagorsk, practically every new rocket and many satellites developed in the USSR and in Russia would come to what would be officially named as the NIIKhimmash test facility. Here, Russian rockets and spacecraft would essentially receive their ticket to fly, following rigorous testing. The center played a crucial role for the certification of the new-generation Angara rocket for flight and it was expected to become a test site again for the Rus family of rockets in the second decade of the 21st century. 2008 June 18: Head of Roskosmos Anatoly Perminov visits NIIKhimmash engine test facility in preparation for the "cold" and live firings of the Angara rocket stage, which was then scheduled for delivery from Khrunichev manufacturing plant on July 15, 2008. 2008 Sept. 2: The second stage module, URM-2, of the Angara rocket is delivered to the NIIKhimmash test facility in the town of Peresvet, (Sergiev Posad Region) for static firing tests. 2008 Oct. 27: The URM-2 module of the Angara launcher is installed into the fixation assembly in preparation for its static firing at the IS-102 test stand of the NIIKhimmash center in the town of Peresvet, north of Moscow. 2009 March 28: A. N. Chulkov, the head of launch vehicles and infrastructure directorate at Federal Space Agency, Roskosmos conducted a meeting of the mobil tower construction management team at NITs RKP in the town of Peresvet (Sergiev Posad), where the 560-ton, 55-meter structure for Soyuz launch complex in Kourou was being assembled. (The actual assembly site was located at former NIIKhSM Remmash facility near Sergiev Posad.). 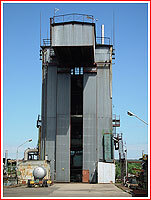 According to Roskosmos, the plant testing of the tower was to start on April 3, 2009. The tower would then be taken apart and shipped to Guiana. 2009 April 29: During "cold tests" KhSI-1 at NIIKhimmash facility in Peresvet, around 100 tons of liquid oxygen were loaded onboard the URM-1 stage of the Angara rocket. 2009 June 18: During KhSI-2 test at NIIKhimmash fuel and oxidizer were loaded into the URM-1 stage. Pneumatic and hydraulic systems tested. 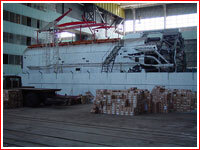 2009 June 24: In Sergiev Posad, Russia, workers start dismantling the mobil gantry in preparation for its shipment to Guiana. 2009 July 30, 17:15 Moscow Time: Angara's URM-1 rocket booster (Article I1A1S) test fired for the first time at the IS-102 test stand in Peresvet near Moscow at NITs RKP test facility (former NIIKhimmash). During the test known as OSI-1, the engine was burning for 232 seconds, essentially imitating the entire process of the first stage operation during the orbital launch. According to preliminary information, no major problems arose during the firing. At the time, the second firing was expected at the beginning of September 2009. The total of three firings of the same booster were originally expected. 2009 Oct. 1: Angara's URM-1 rocket booster test fired for the second time at NITs RKP test facility (former NIIKhimmash) in Peresvet near Moscow. During the test known as OSI-2, the engine was burning for 203.4 seconds under maximum throttle possible, imitating the flight profile of the Angara-5 vehicle. 2009 November: The URM-2 upper stage module of the Angara rocket is rolled out to the IS-102 test stand in Peresvet near Moscow at NITs RKP test facility (former NIIKhimmash) for fitting checks. The thermal conditioning and fire safety system was also tested. 2009 Nov. 26: Angara's URM-1 rocket booster test fired at NITs RKP test facility (former NIIKhimmash) in Peresvet near Moscow. Designated OSI-3, it was the third and final test of Angara's first stage. The test cleared the way to preparations for live firings of the URM-2 upper stage of the Angara rocket.